Every month we will outline the progress of the Tiller Talk key farmers and introduce timely tips to help you inform your own pasture management decisions. See the results of different management decisions year-round as these farmers work to improve the growth and utilisation of pasture. 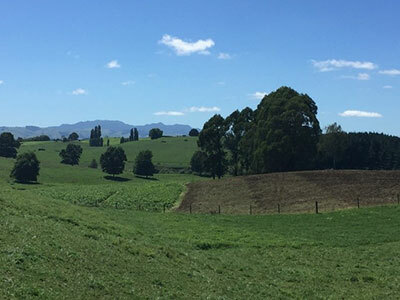 The high temperatures and moisture stress in many parts of New Zealand through February has put considerable pressure on home-grown feed supply. Some key points from the Tiller Talk farmers. Manage rotation length, and bring in supplements to avoid over-grazing and maximise re-growth after it rains. Much of the country has been hit with some dry weather over summer. 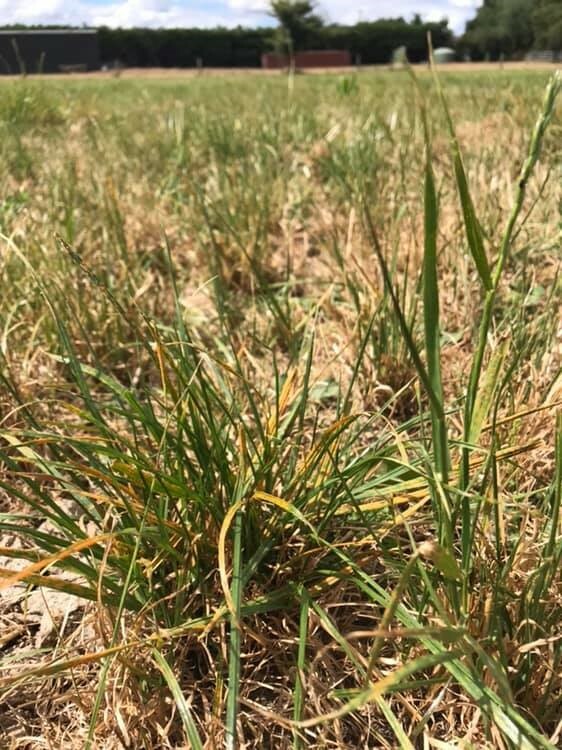 Once a significant amount of rain has come, up to half of the available grass will disappear as the dry material begins to rot or decay. So, what can we do to ensure new grass growth is maximised over this period, and that pasture covers are rebuilt for next season? Review rotation length. Depending on what rotation you are on, this may need to be pushed out to allow for the new pasture to take off. Give pasture time to recover. To avoid under-feeding, it may be important to have supplement available to feed out after rain. If feeding out before the drought the amount required after rain will at least double in the first 7-10 days, reducing as pasture cover improves. There is often weight loss associated with feeding pasture grown in the drought recovery period. That is why supplements are needed, if the rotation length is to be maintained. Which supplement to purchase? When deciding on purchasing and feeding supplements in mid lactation consider the milksolids response and the total cost of feeding the supplement. Determine the economics of feeding supplements: there are resources available to help calculate the cost/benefit of adding supplements to the system. Even if feed is limiting production, removing culls, empties and non-productive cows should be considered first. During a drought, soil N reserves tend to increase, so N applications can be delayed several weeks after the rain. The response to autumn applied N takes place over three months, so take this into account when making the final drying off decision. See Farmfact Nitrogen use after a dry summer. It typically costs between $900 and $1200 per hectare to renew pasture - a significant investment. So how do you get the greatest production gains for your money? The answer is to renew paddocks that are underperforming - rather than those already doing well. Use weekly pasture cover records collected throughout the season. If you use a pasture management programme (Pasture Coach®, MINDA® Land & Feed, etc), entering grazing dates will improve calculation of weekly growth rates/paddock. Use number of grazings per paddock. Walk the farm 2 or 3 times a year to score each paddock on a scale of 1 to 5 and pencil which paddocks are thinning out and losing quality (e.g. large weed content). Another tool available to farmers to help identify poor performing paddocks is the Pasture Condition Score Tool. In the example below (LUDF), the three colours represent the three soil types on the farm. Within each soil type block, identify what potential DM yield gains can be made by comparing the highest and lowest performing paddocks; for example, in the same block paddock N2 in blue is yielding 4.7 t DM/ha less than N9. Range in pasture grown (t DM/ha) for individual paddocks (example for LUDF, season 2016-17). Investigate why these paddocks are the lowest producing: underlying issues? Then fix! Aaron renovates poor performing paddocks identified by pasture walks, growth rates and weed issues. Soil fertility and pasture density are monitored throughout the season. Pasture renewal decisions are made in spring for the following autumn. Permanent Pasture >>> Chicory >>> permanent pasture. Weeds are sprayed to ensure optimum pasture quality and reduce competition for ryegrass and clover. Aaron ensures the paddock is not pugged or overgrazed during the first season. 7-12% per year, depending on the area of poor performing pasture. AR37 or NEA2 endophytes are used for black beetle and Argentine Stem Weevil protection. After chicory the paddock is power harrow (light), seed is sown using an air seeder, and the paddock is rolled. Spray new pasture 4-6 weeks post-sowing when clover reaches 2-trifoliate-leaf stage. Select @ 4L/ha - broadleaf weeds. Preside @ 30g/ha - only if chickweed is a known problem. Bonza Uptake Oil @ 1L/ha - only if using Preside. Spray @ 10-22km/h at 100-200L/ha application rate. Graze new grass as soon as it passes the “pluck test”, nip off only. Don’t let the ryegrass get too long or it will smother the clover and reduce its survival in the sward. Urea applied at a rate of 40kgN/ha after the first grazing, when soil temperature is >6°C. What are the non-negotiables between now and new pasture establishment for autumn renewal? How have the spring/early summer weather conditions and pasture growth impacted your pasture renewal decisions compared with last year? 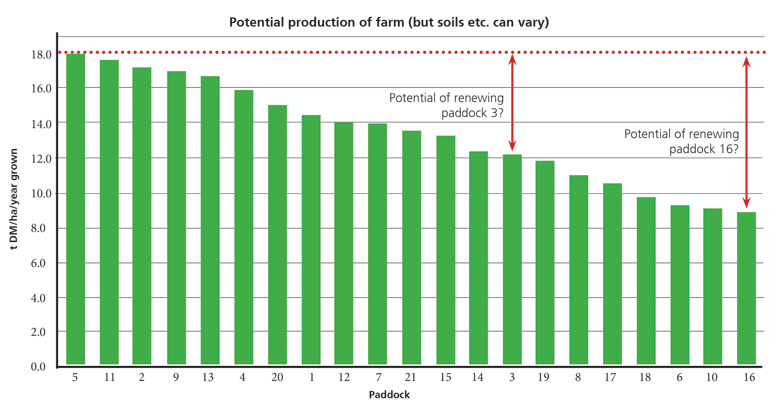 Reasons for lower performing paddocks must be addressed before renewal (i.e. drainage, fertility, compaction etc. if necessary). Use treated seed, especially in the North Island. Seed bed preparation needs to be done correctly, and minimum tillage used if possible. Ensure that seed isn’t sown too deep or in wide rows. If possible, sow clover separate from ryegrass. 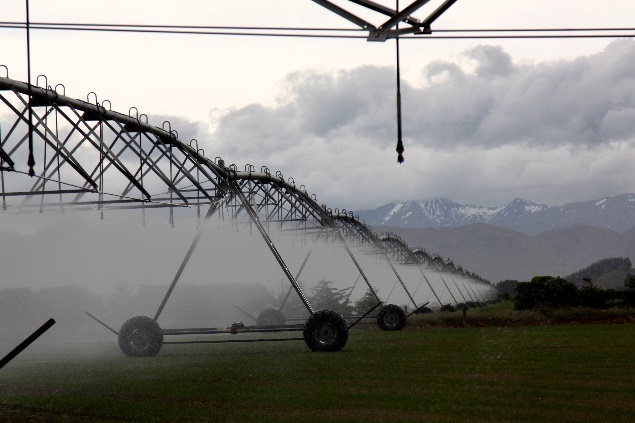 Water restrictions for irrigation schemes are becoming more common. Have you got a plan for restrictions this summer? We talked to DairyNZ's Catchment Engagement Leaders to get their thoughts on ways farmers can maximise available water. If your scheme allows you to, irrigate only at night as there is less evapotranspiration occurring at night, so more water will get into the soil. Prioritise efficient methods of irrigation – turn off the K-lines and sprinklers and prioritise the pivots – these application methods will lead to an increased response from water being applied and will give you better bang for your buck. Slow down your irrigator speed and apply 15ml every 3 days rather than 5ml every day – this will lead to less water being lost to the environment during application and a higher rate of infiltration into the soil. Depending on your irrigation scheme and their individual regulations, some of these tools may not be available to you but we encourage you to talk with your irrigation company and find out whether any of these tools are available to you. The timing of first grazing of newly sown pasture should occur when white clover seedlings are small rosettes, and before lateral expansion of the plant begins, to avoid damaging new stolons. Nutrients and light influence the ability of white clover to thrive. To improve white clover content in pastures, control pre-grazing pasture cover to limit light shading from ryegrass, and post-grazing residuals to avoid over grazing. White clover adds to total pasture growth – it does not generally substitute for ryegrass growth, and yield gains come mostly in summer, when extra feed grown has a high economic value. New Zealand research has shown that when white clover comprises 10-40% of total dry matter (DM) in summer, DM gains are between 1.4 and 3.4 t DM/ha/year. Soil pH needs to be 6 or above with at least optimal levels of P, K, S and magnesium Mg (table 1). This helps clover compete effectively for the major nutrients, where it is typically at a disadvantage because it has a shallower root system compared with ryegrass. Clover has higher requirements than grasses for all nutrients (except N). For instance, ongoing applications of phosphorus (P) fertiliser will be in vain if the clover is limited by sulphur (S), potassium (k) or molybdenum deficiency. Molybdenum is critically important for N fixation. Take clover-only herbage samples to check for mineral nutrient deficiencies. Fertiliser rates can play a large role in how well clover establishes and grows in a mixed pasture sward. Increased use of N fertiliser in the pursuit of higher milk production over the past two decades has suppressed clover performance. Why is this? Under high soil N, ryegrass grows more quickly than clover because mineral N uptake requires less plant energy than the combination of N uptake and N fixation that clover uses for growth. This competition from ryegrass suppresses clover, but the ryegrass also uses soil N and reduces it to lower levels. Maintaining white clover while also using N fertiliser are not necessarily incompatible, provided grazing management controls the competition from ryegrass for light, particularly from late winter and through spring: excellent control of pre- and post-grazing covers to limit the shading competition from ryegrass is essential to achieve clover content in the range of 20-40% of total DM. Recent research studies in Waikato and Canterbury measured the seasonal and total annual yields of pastures sown either with or without clover, and receiving either low rates of N fertiliser (50 and 100 kg N/ha/year in Waikato and Canterbury, respectively) or high rates of N (225 and 325 kg N/ha/year in Waikato and Canterbury) - for seven years. Better quality feed. Almost all the additional feed comes in summer, when extra feed has high economic value and it is of high digestibility, due to the clover content. 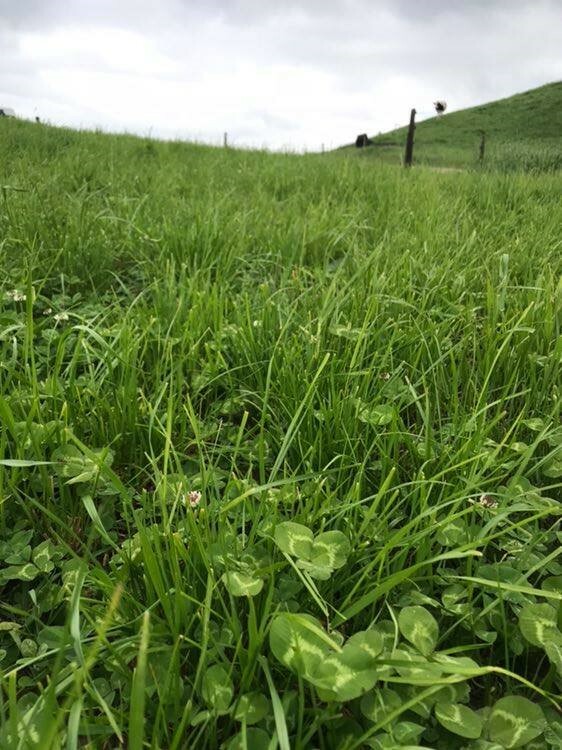 Good clover-ryegrass mix vital for a productive pasture: click here. Understanding how white clover grows and interacts with ryegrass: DairyNZ Technical Series, December 2016 page 1-4; click here. The importance of having a good mix of clover and ryegrass to produce high quality feed should not be underestimated. White clover is a perennial forage legume with an optimal growing temperature that is 5°C higher than perennial ryegrass. This means it can maintain higher quality from late spring, when ryegrass goes to seed. By fixing nitrogen (N) into the soil it is the ultimate companion for a ryegrass-based pasture. So, what can we do to help white clover thrive in our pastures? To increase white clover content in pastures it is key to understand and manage competition between grass and clover. While the ryegrass-white clover is the “ideal” mix, the reality is that ryegrass and clover plants are in constant competition with each other for light, water and nutrients. 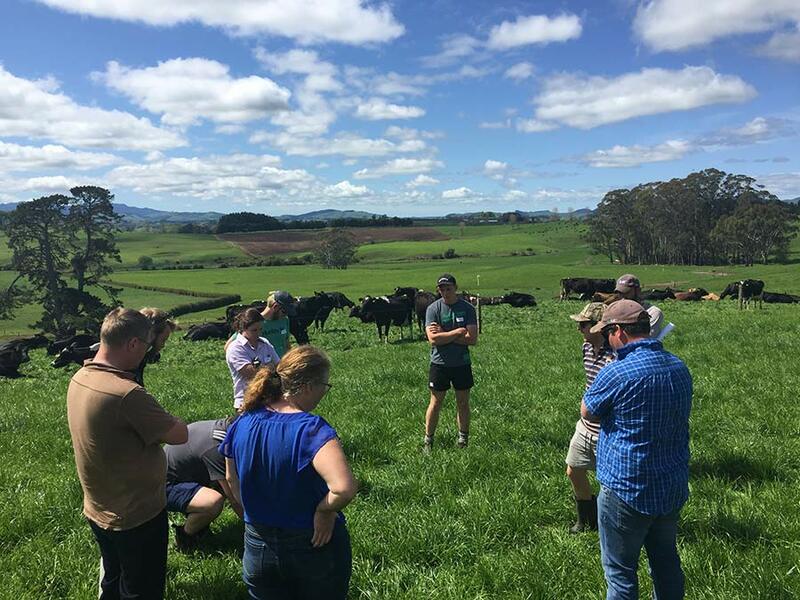 At recent workshops over spring, Tiller Talk farmers discussed the importance of high pasture quality leading into summer, the value of getting post-grazing residuals right, and what to do when you don’t. Maintaining high quality pasture through good grazing practices will help maximise late spring and summer milksolids production. The post-grazing residual from which a pasture regrows has a significant impact on pasture composition and quality. At this time of year, achieving post-grazing residuals of 1500-1600 kg DM/ha (as often as possible) helps control the emergence of seed heads which impacts on pasture quality available at future grazings. Research in New Zealand and overseas has demonstrated that, during spring, lax grazing results in pastures with greater stem content, higher amounts of dead material and lower digestibility at subsequent grazing events. As a result, undergrazed pastures in spring will support lower levels of milk production in early summer. Tiller Talk farmers' options to help regain quality, if necessary. Mowing can be used to help reset residuals, and therefore maintain high pasture quality during a period of surplus, or if cows did not achieve target post-grazing residuals at the last grazing. Both pre- or post-graze mowing have benefits and disadvantages. Pre-graze mowing can be used as a tool to manage a small surplus or to restore quality. Cows grazing covers (above 3200 kg DM/ha) can make hitting target residuals challenging. Pre-graze mowing has been proposed by some as a way of re-setting target residuals and maximising pasture utilisation. Cons: expect some pasture to be wasted when mowing (waste can be of high quality e.g. small leaves and clover falling at bottom of sward), additional time, and cost. Mowing residual pasture after grazing will also help maintain pasture quality through the late spring. This method is typically used to correct errors in pasture allocation – for example pre-grazing covers were under-estimated. For post-graze mowing, the general rule of thumb is to ensure it is carried out within 24-hours of grazing, to avoid cutting off pasture regrowth. Cons: waste of pasture; cost of time, diesel and depreciation; only useful for small feed surpluses. increasing grazing pressure so that recommended post-grazing residuals are maintained throughout spring and summer. In 2016-2017 a pre-graze mowing trial was carried out at the Lincoln University Research Farm, which examined the effects of pre-graze mowing as a management tool. This trial did not show any advantage of pre-graze mowing on cow dry matter intake. For full results click here. Identifying and removing pasture surpluses as they develop, and ensuring post-grazing residuals are maintained as grass begins to enter its reproductive phase, are critical to maintaining pasture quality. If you can allocate the appropriate level of pasture to meet the herd’s demand then, where possible, saving any supplements on hand or contracted for later in the season makes sense. But, is it worthwhile using nitrogen (N) or PKE to generate an artificial surplus? We asked our Tiller Talk farmers their views on the above – see their answers below. DairyNZ senior scientist Dr Jane Kay also addresses the second part of the question and explains what we need to consider when feeding PKE to generate a pasture surplus. Dr Jane Kay - what we need to consider when feeding PKE to generate a pasture surplus. What is the cost of generating a pasture surplus using N, or PKE and is it worthwhile? How much nitrogen fertiliser have you already applied this spring? This will influence the pasture growth response (kg DM/ kg N) and cost per kilogram of pasture (DM) grown. What is the likelihood of the supplement being required for your system? i.e. how much pasture silage is needed? What are the requirements for feed such as pasture silage with adequate protein content for summer on your farm? Here is a scenario that compares the cost of making 1kg DM pasture silage from surplus grass by using either N fertiliser or PKE to generate a pasture surplus (one supplement example). Note the assumptions used in this scenario will differ from one farm to another dependent on costs, management and response rates. In this comparison we assume best practice management (e.g. grazing to 1500 residuals and capturing all the surplus pasture that has been generated). Other factors such as cash flow, interest rates, time, weather, and purpose will also influence this decision. Cost of making silage using N: 30-35 cents/kg DM pasture silage, if extra pasture grown is harvested. For more information on using nitrogen at the right time click here. PLUS the cost of feeding PKE. At a minimum this includes the costs associated with feeding (e.g. fuel, labour, R&M: approximately 10% extra); however, Dairybase data indicates the total cost to the system of feeding supplements is on average 1.5 times the cost of purchasing the feed. Therefore, the minimum cost of feeding PKE is 46c/kg DM, but may be costing the business 54c/kg DM. Total cost of making pit and bale silage after allowing for wastage is: $0.89 and $1.00 /kg DM respectively. If pasture and supplement is managed well, PKE feeding can produce additional milk. The milk response from feeding PKE with 70% substitution was estimated to be 40g/kg DM. Milk price of $6.50/kg MS x 40 g= 26 c/kg DM of PKE fed. This is assuming best practice management and grazing to 1500 residuals. To make 1 kg DM silage requires 1.7 kg DM PKE, so total milk revenue of 44c. NET COST OF FEEDING PKE AND MAKING SILAGE 45 - 56c/kg DM pasture silage if all spared pasture is harvested. Waikato Tiller Talk key farmer Dave Swney explains how he manages grazing rotation in early spring, and why achieving pre and post-grazing cover targets early in the season are essential to maximising pasture quality and utilisation. Tiller Talk farmers have been using the information collected on farm walks to support renewal decisions. pasture composition, i.e. presence of weeds and less desirable grasses. Allen Mills renews 7% of his farm each year as part of his fodder beet cropping regime, and an additional 3% in summer/autumn if seasonal pasture surplus allows. "The difference between the top and bottom performing paddock is typically 3,500 kg DM per annum on our farm. If we can reduce that gap we'll lower our reliance on bought-in feed," Allen says. • Keeping good records such as annual pasture growth per paddock, fertiliser history, and visual assessments helps with the timely selection of paddocks especially when having a crop rotation in the pasture renewal process. • Consider paddock performance in the context of one year of forgone pasture yield (for crop establishment/ harvest time). In the example below, paddock 3 has the potential to grow an extra 6 tonne DM/ha/year while paddock 16 an extra 9 tonne (Source: Paddock selection) hence has the potential for the greatest return on your investment. • Note for successful fodder beet establishment and growth, paddock selection is critical. Further factors such as soil type, herbicide residual and paddock shape need consideration. Click here for more information. Clover establishment can be compromised when it is sown too deep. Often when white clover is bought pre-mixed with ryegrass, the 1-2 cm depth drill (optimum for ryegrass) can be too deep for optimum clover establishment, and clover seedlings are forced to compete with more vigorous ryegrass seedlings in the same drill row. Broadcasting clover into spring pastures, using the fertiliser spreader or putting clover into a separate seed box which drops seed on the soil surface, are options for improving clover establishment. Plantain can be tricky to sow at the same time as ryegrass, typically due to its sensitivity to herbicides. Farmers have seen good results broadcasting after ryegrass establishment and weed sprays. Read more on plantain establishment here. Grazing management during and after calving largely determines production to Christmas. Achieving the target average pasture cover (APC) at balance date is critical to ensure the cows have sufficient high quality pasture in peak production months and during mating. To help you during calving and up to balance date, the Spring Rotation Planner takes the guesswork out of grazing management over this critical period. Some of the Tiller Talk farmers share their experience with the Spring Rotation Planner (SRP). Drawing the spring rotation plan: how did you pick rotation length at balance date? What do you plan to do if APC is lower than target at any time between PSC and balance date? Figure 1. 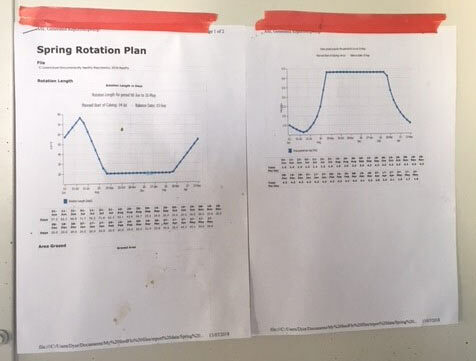 Spring rotation planner: rotation length chart drawn by Brett Steeghs using the SRP advanced planner. What tips would you give to a farmer who has never used the SRP before? Review process: how do you engage with your staff on the SRP? Figure 2. Sue and Mark Dyer’s spring rotation planner on the wall at the cow shed. Farms walks are even more important at this time of the year to compare actual APC against target, and adjust daily area allocated (m2/cow) and supplementary feeds if needed to get back to the targets set on your plan. How much pasture have you harvested last season? 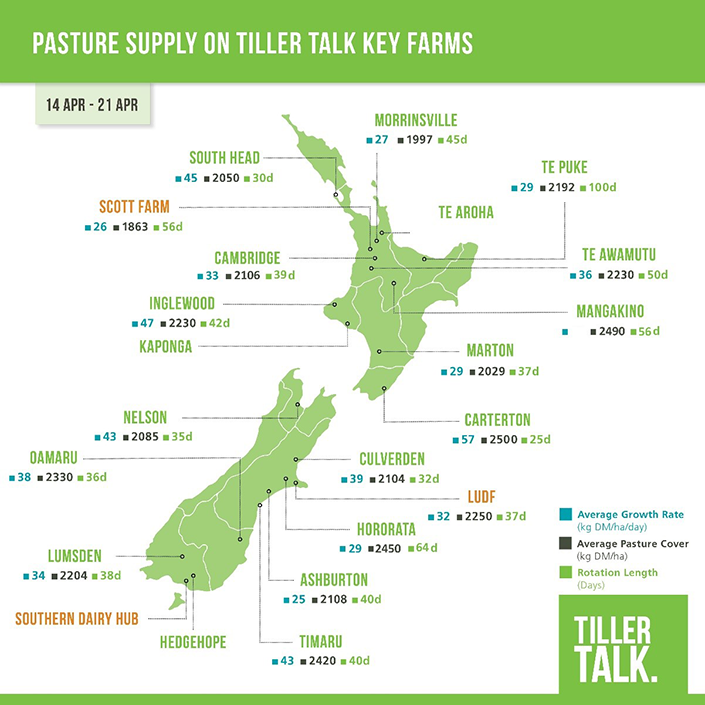 Last month we asked the Tiller Talk key farmers to work out their pasture and crop eaten per hectare for the 2017-18 season (Fig. 3). Some regional groups of Tiller Talk farmers got together to discuss their results and opportunities for improvement on their farm. How do you compare with the figures shown below? Calculating a pasture and crop eaten figure allows you to assess whether you are getting the most out of your homegrown feed. Click here to calculate your pasture and crop eaten per hectare figure online. Mangakino Tiller Talk group on Brett and Ruth Steeghs' farm, last spring. In this month’s update we asked our Tiller Talk farmers how they are responding to common autumn management issues. First grazing and weed control in new pastures: how are you tackling it? Started grazing (nip-off) the 20 hectares of new pastures on April 21. Getting the autumn-sown paddocks back in the grazing rotation will help build pasture cover to reach average pasture cover (APC) target at planned start of calving. One litre per hectare of Conquest (active ingredients: Picloram, Triclopyr) was spayed to control well-developed broadleaf weeds in the pastures (photo 1). The chemical effectively knocked down the weeds but white clover also. These paddocks were undersown with permanent ryegrass (20 kg seed/ha). Broadleaf weeds in pasture before weed control occurred. Dave used bentazone, MCPB, and Flumetsulam (active ingredients) plus oil to target weeds in new pastures such as chickweeds. In Dave’s view the high-water rate (300 L /ha) was a key factor in successfully controlling weeds on his farm. Both Michael and Dave will broadcast some clover in spring to replace any clover seedlings taken out by the post emergent spray. Kathy and Logan have booked the contractor to spray weeds on the new grass paddocks. Once the new grass passed the pluck test, Kathy brought the weaners and dairy replacements to lightly graze (nip-off) the new pastures. Kathy and Logan also applied slug bait around the outside of the paddock, monitoring for slugs. It has been an issue in the past. The typical timing for first grazing is 6-8 weeks after sowing a perennial ryegrass pasture (1-2 weeks sooner for an annual, Italian or hybrid). Some herbicides can harm clover plants when applied before seedling clovers have grown two trifoliate leaves. Find more information about controlling weeds early in a pasture’s life on page 28 of the Pasture Renewal Guide. For assistance with identifying weeds and control methods, visit AgPest or contact your local chemical representative. How are you managing feed and animals this autumn to achieve your BCS and APC targets at calving? 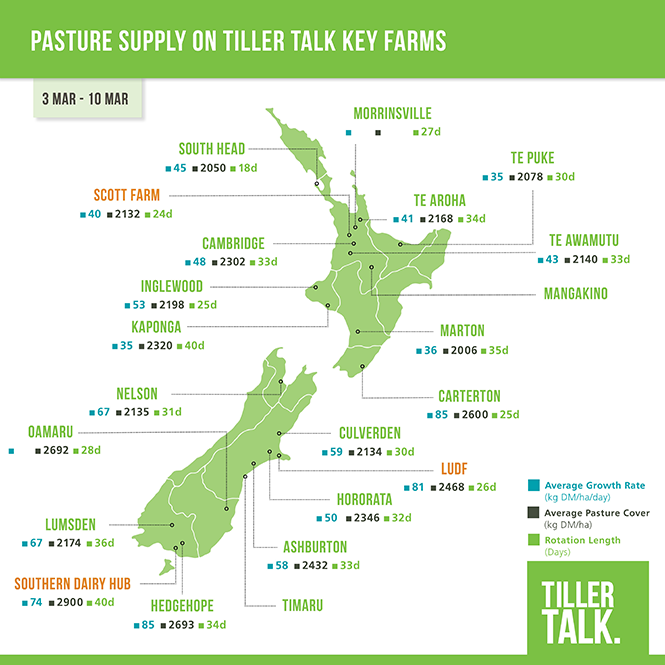 In most regions, the Tiller Talk farmers have recorded a considerable reduction in pasture growth rates over the past few weeks leading them to extend rotation length and reduce feed demand on the platform. Southlanders Blake Korteweg and Wilco Hamers are supplementing the cows’ diet with grass silage and PKE, respectively, to extend the round. Wilco and team are preparing the wintering barn which they can use when soils get too wet. Thomas Irving, Hororata: cows grazing 5 kg DM/day of fodder beet plus 2 kg DM/day of oat silage in addition to grass. In Culverden, given the significant decline in APC lately, Hayden Fletcher has worked at reducing feed demand. Cull cows left the platform and 150 cows were dried off on April 27. Supplement (PKE) will shortly be added into the cows’ diet and N fertiliser is being applied to help build pasture cover. 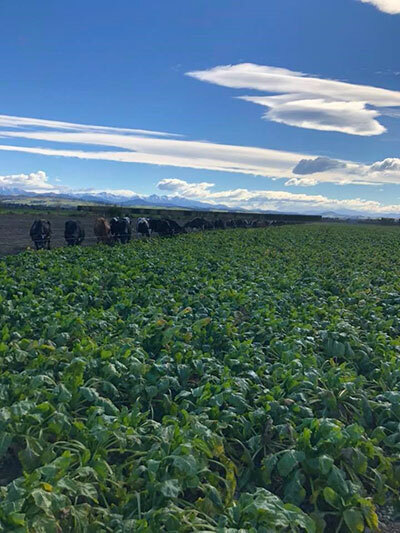 Like Hayden, Thomas Irving (Hororata) and Nick Webster (Oamaru) have started transitioning the cows onto fodder beet. Nick is lifting the crop before feeding it to the cows. Thomas is milking the empty cows once a day (OAD); this mob is used to clean up paddocks whilst still being milked. 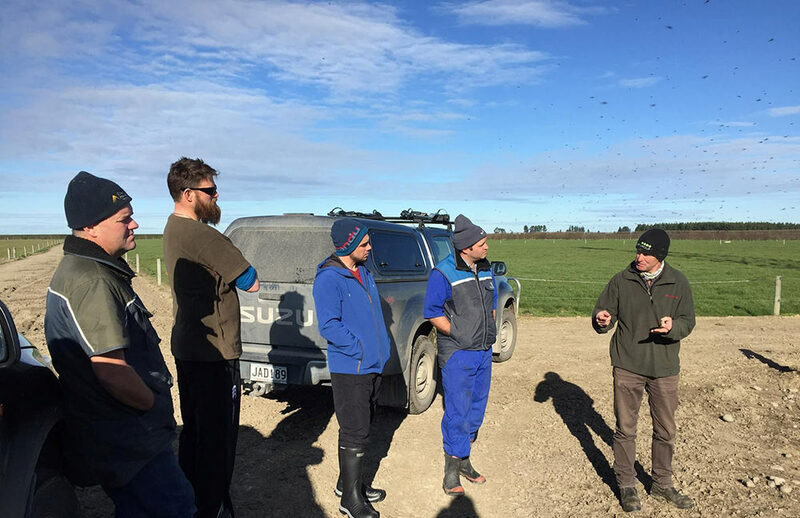 Further north, Murray Linton and team, in Te Puke, started drying off on April 19 whilst extending rotation length to 70 days and using PKE to do that. The cows are grazing down to 1400 kg DM/ha residuals. 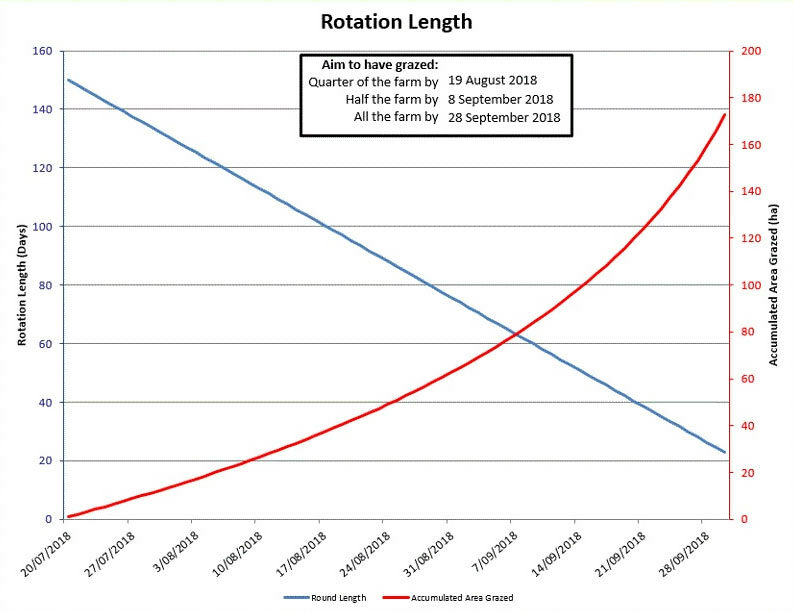 The Waikato Key Farmers are currently maintaining rotation lengths between 45 to 55 days whilst reducing feed demand. Te Aroha farmers Sue and Mark Dyer are making their drying off decisions based on BCS, milk production and time until calving. In Inglewood and Mangakino, both Rob Buchanan and Brett Steeghs are using baleage and PKE to help increase, or maintain, rotation length. Rob is now milking the lighter and low-producing heifers OAD; at Brett and Ruth’s the whole herd is milked OAD, and cows with low BCS are being dried off. In South Head, the Watsons are prioritising drying off all their spring-calving first calvers and any mature cows with BCS less than 4.0. There are a number of strategies you can use to get every cow close to her ideal BCS at calving. To find more information, visit the BCS strategies webpage. Want to find out when is the latest dry off date to meet BCS targets at calving? Check out this new calculator. About to graze new pastures this autumn: have you checked nitrate concentration? Some Tiller Talk farmers in the North Island tested pastures for nitrate concentration. New pasture ready for first grazing showed high nitrate concentrations (60 to 250 mg /kg DM) leading the farmers to delay first grazing. 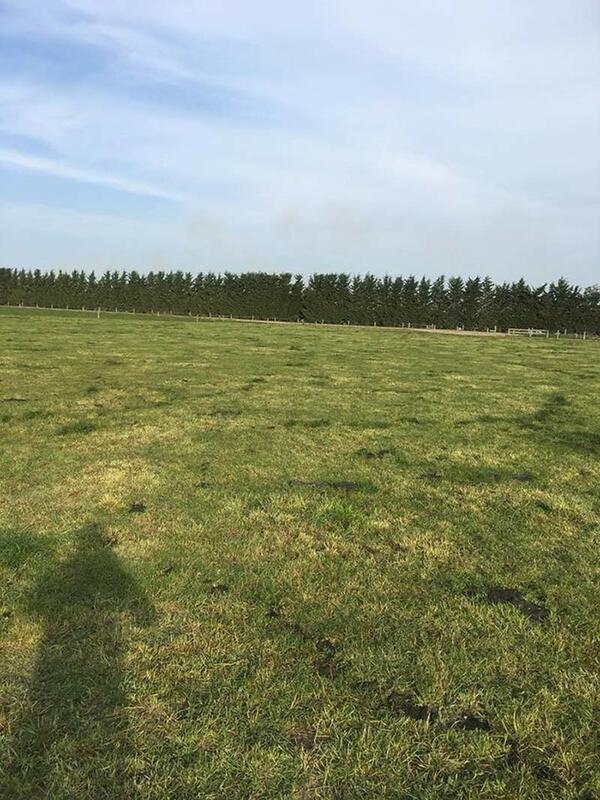 Dave Swney’s new pastures (Te Awamutu) will be grazed by the calves - a nip-off only - once nitrate concentrations come down to a safe level for grazing. 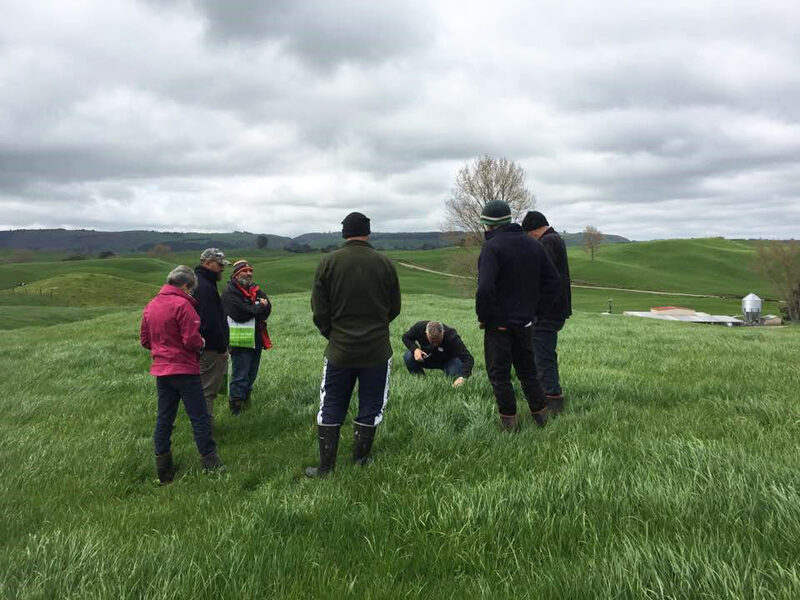 In Mangakino, when Brett Steeghs tested their new pastures of annual ryegrass at the end of March, nitrate concentrations were also high, approximately 70 mg/kg DM. The cows were sent to an established pasture for a first feed before grazing the new pasture for a few hours in the afternoon. Plant nitrate concentrations exceeding 20 g/kg DM (2%) should be regarded as potentially toxic. first grazing of any annual ryegrass and new permanent pasture. Can we prevent nitrate poisoning? 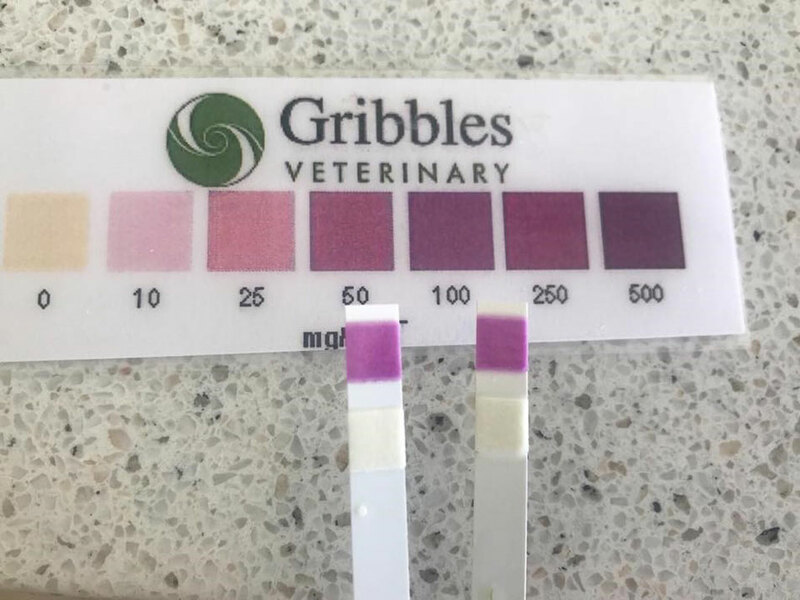 Monitor nitrate levels in the plant: test your pasture (the kits you can use are colour coded: safe, caution, toxic). Feed forage supplement first and restrict the time on high risk pastures. Stock also need to have access to fresh and clean water. Check for signs of poisoning. Clinical symptoms include weakness, rapid weak pulse, a fall in blood pressure and convulsions likely followed by death. Find out more about the weekly feed situation on your local Tiller talk key farm on Farmwatch. As we transition from summer to autumn, we asked the regional Tiller Talk key farmers how this season’s weather conditions have impacted their autumn pasture management, including pasture renewal decisions and autumn feed budgets. How has the challenging 2017 winter/spring impacted your pasture renewal decisions this autumn? “We plan to do some pasture renewal (grass-to-grass) but it is getting quite late now. Ideally, we like to have the grass sown before March 1. We are currently waiting on some drainage to be done and mole ploughing” (20 February). 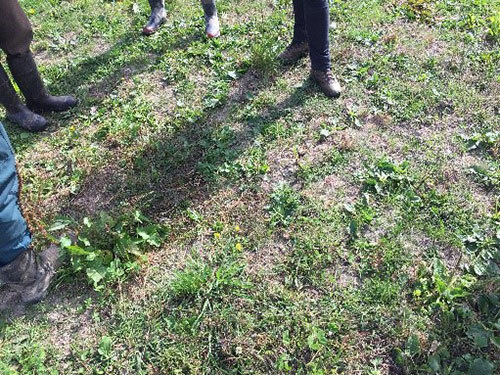 “The rotation at our place is: grass to chicory to permanent pasture. The paddocks selected for renewal were those damaged in spring due to the wet weather. This reduced our ability to select paddocks based on pasture performance. The key for pasture renewal is early sowing and establishment to ensure we get two grazings prior to winter”. For more information on how to select grass cultivars, prepare paddocks, and guidelines to get your new pasture establishment right, click here. How has the season impacted on your autumn feed budgets? “It has been very hot especially late December through the whole month of January. This has affected production over that period as cows were spending more time cooling off and less time at grazing. The soil has been dry even with irrigation going full on. I’ve extended my rotation length to 30 days at the beginning of February, but it has been difficult as grass growth has not been as high as expected, resulting in more supplements brought in the system to maintain rotation length. This might impact the autumn feed budget. In some regions, there were unusually high summer pasture growth rates. How did you respond? “Our feed budget is looking rosy due to the rain through January and February. We dropped some paddocks out of the rotation for silage in order to maintain pasture cover targets.” (18 February). Why should I complete a feed budget? 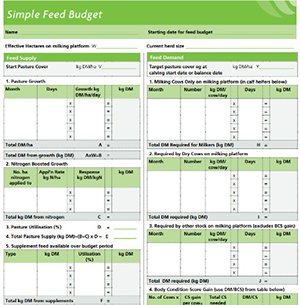 Feed budgets are a farm management tool. It is most important for winter and spring to plan feeding levels. The main feed budget should be done in March/April and reviewed regularly (i.e. every 3 to 4 weeks) until after calving. The first budget is needed to establish a target drying off date; this can be adjusted to help balance the budget. This will also be influenced by cow condition and farm covers. The lower it is for either, the earlier drying off will have to be to ensure feed cover can be lifted and/or BCS put back on the cows. Read more. I have harvested grass silage (or am about to do so) to control summer pasture surplus. What do I need to consider next? High pasture growth rates in some regions have resulted in atypical excess pasture supply this summer. Some farmers have deferred grazing part of the farm (by 2 or 3 weeks), or pre-graze mown paddocks with longer pre-grazing yields, and some farmers chose to remove paddocks at the top of the wedge for silage. Autumn pastures have a lower feed value to the animal than spring pastures; it’s not clear exactly why. Sugar levels are less than in spring due to shorter periods of daylight. This will impact the fermentation process: when pasture is ensiled, its sugars are converted into lactic acid by bacteria. It is the lactic acid which pickles the pasture, allowing it to be preserved for a lot longer than it would have been if left in the open air. Read more here. This, combined with the high protein levels means the selection of an appropriate additive is crucial to ensure adequate fermentation. Where summer grasses and annuals weeds are widely present in the pasture, expect quality of the silage to be less than spring silage. For example, a cow being fed 4 kg DM of grass silage at 10.5 MJ ME/kg DM would need 4.7 kg DM of poor quality silage at 9 MJ ME/kg DM to provide the same energy. That’s an extra 2 bales per week for 100 cows (@200kg DM bale). Mark the bales made this autumn to distinguish them from spring baleage. Send a sample for analysis – knowing the quality of the silage will help you use the feed accordingly (e.g. lower quality silage to dry cows this winter). Note: in warmer regions of New Zealand, as autumn arrives, high pasture covers can quickly disappear. Summer grasses stop growing and the ryegrasses are weakened from having to compete with them through the hotter months. The sharp decline in pasture growth rates can have unexpected consequences for a farm’s feed budget so it is important to keep monitoring pasture covers each week.